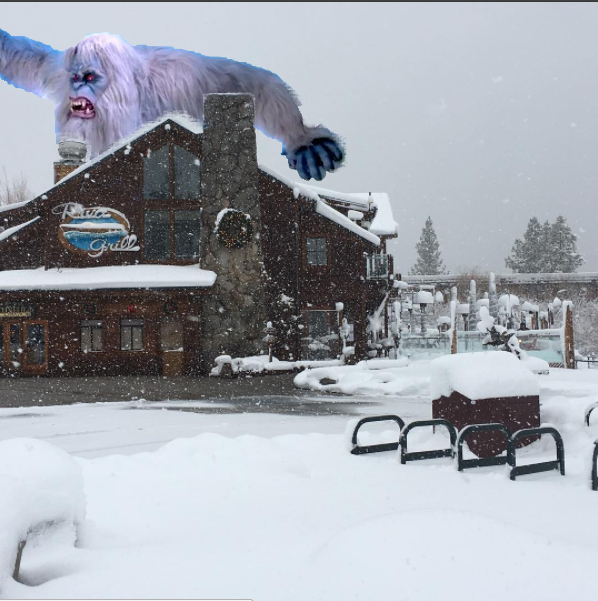 Home » Adventure » Local Update: 23 feet of snow since Jan 1, Tahoe Yeti spotted about town, and more…. Tahoe’s gotten a whopping 23 feet of snow since New Years. “About time.” say locals. January has been quite the month for Lake Tahoe. 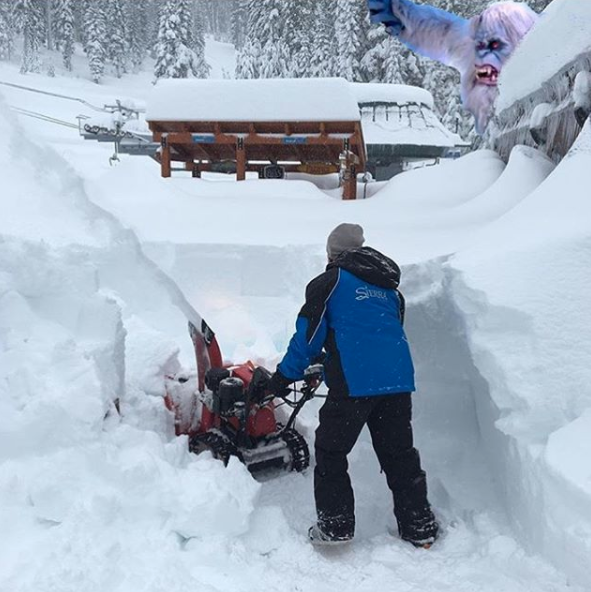 If you’ve got a pulse and two eyeballs you may have noticed the recent profusion of snow/shoveling/dog-frolicking-through-powder photos and videos on social media. Indeed, Snowpocalypse 2017 is upon us. 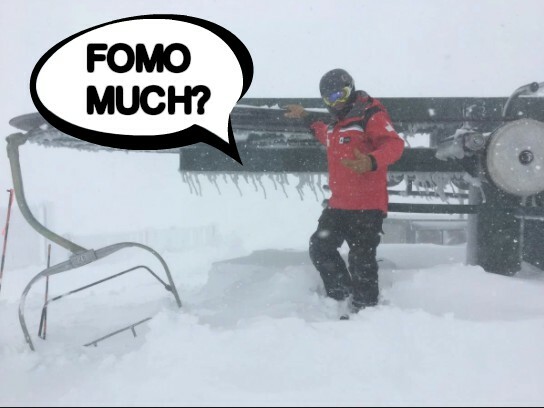 According to the National Weather Service, snowpack above 6,000 feet hovers at about ten feet, while various resorts are boasting more than double that! Things haven’t been easy for the Tahoe Region, however. Ski resorts weren’t able to operate, mail delivery stalled, the Tahoe school district has maxed out on snow days, and constant power outages are still plaguing North Shore. On Monday, Gov. Jerry Brown issued a state of emergency for 50 counties, including El Dorado, which means Tahoe can expect some cash flow from Big Daddy Cali’s wallet to help rebuild. So, is there such a thing as too much snow? 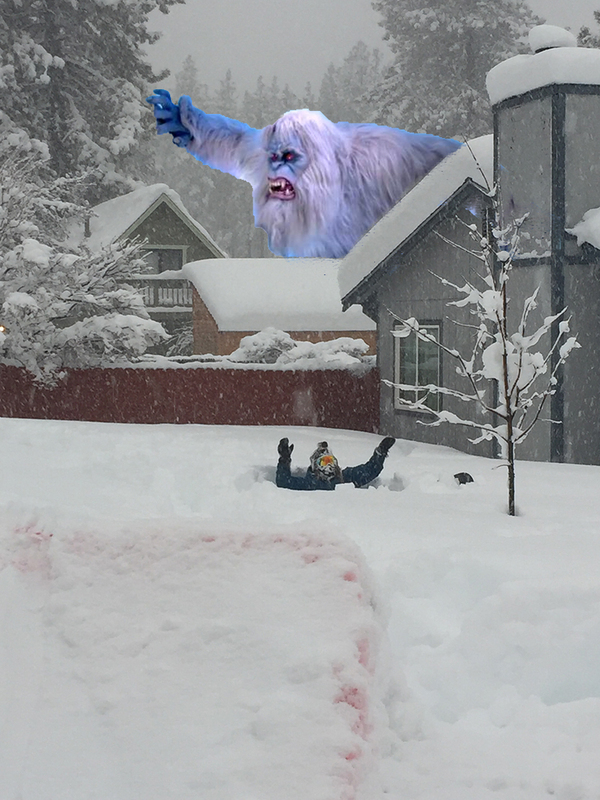 According to photographic evidence found on Instagram, a Yeti has been making its rounds through the Tahoe area. No confirmation on whether it was in search of pow or pickles. 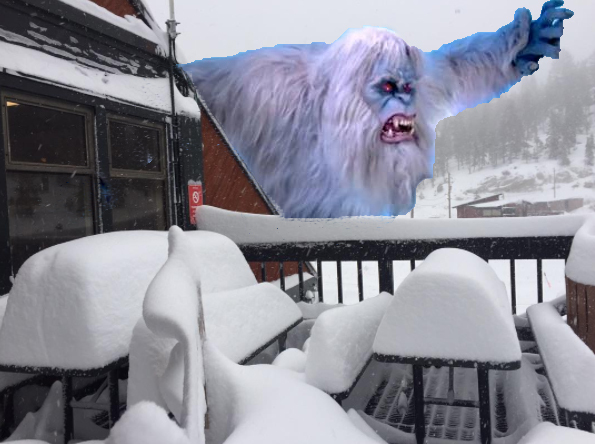 As seen here, the Yeti was spotted at Sierra-at-Tahoe’s west bowl. This image suggests that the Yeti may have been dancing along to the Bee Gees “Stayin’ Alive”. Research suggests that Yetis have a penchant for fruity cocktails with a high percentage of alcohol, hence why our big-footed friend was spotted at Riva Grill, home of the Wet Woody cocktail. This photo was taken at Heavenly Resort. It is believed that the Yeti was in search of fresh pow. Ski Patroller dies while performing routine avalanche control duties. We lost a great man this week. On Tuesday morning, Joe Zuiches, 42, was running his avalanche control route at around 8:30 a.m. when a sudden explosion took his life. It is known he was carrying an undisclosed amount of ammonium nitrate based charges at the time of the incident. He is survived by his wife and infant son. If you’ve got a couple of extra bucks you could spare, please consider taking the time to donate to his GoFundMe page.